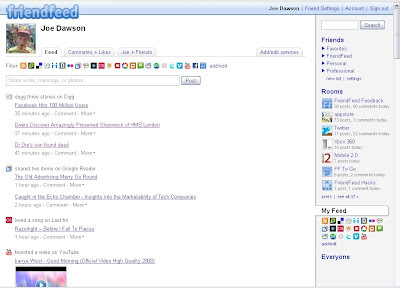 FriendFeed development has been quiet recently although rumours about a new design increased when people began noticing referrals from beta.friendfeed.com. Facebook has generated a lot of the headlines lately with the migration to the new user interface, and earlier with the announcement that they have now passed the 100 million mark. All that said apparently a large portion of the Facebook population are still yet to embrace the updated version. Facebook has copied very similar features to FriendFeed now with it's updated interface so to keep the site engaging where would the developers innovate and would the interaction remain the same. The first change I noticed straight away was that the tabs across the top of the screen had been removed. They have been relocated into a right hand panel with more functionality and customisation. Friends now allows us to group the people we subscribe to into Lists which makes sense, especially if you are subscribed to a large amount of users. Selecting Friends displays the Home feed and all the people you subscribe to but underneath are sub categories where we can add our friends into Lists. Even removing them from the Home feed if desired, I would have liked to have seen a Service feature made available here for us to set up a specific Import related List which is what a few people have requested. What I like when adding friends to a List is when typing a name in the search box it provides a drop down with the matches for the letters I have entered. Navigating down the right panel to Rooms we can now select what Rooms we want to have displayed on our feed. Those we select to be displayed are visible with the Room icon and also details on activity including posts and comments. Next there is My Feed which can also be accessed by clicking on the username at the top of the screen. This presents us with the tabs that we were familiar with previously but now they are for our Feed, Comments + Likes and Joe + Friends. My Feed is for all my imported items/shares and Comments + Likes displays everything I have actioned and this can also be separated from both being visible into the individual action. One aspect missing is the amount of Comments and Likes I have contributed but this is still visible when checking my friends activity by hovering the cursor over their name. At the end of the tab bar there is another tab for Add/Edit Services which is better set up than the previous build allowing me to edit my imports and refresh the feeds. I still rarely check the Everyone view as it's like venturing into the wilderness but it's good to have it available to venture into occasionally. Onto Friend Settings and the core features are still there but now with integration with the Lists so from the My Subscription view we can see who we are subscribed to and our association with them with the Lists. The Recommendations have been improved although I would like to see how we are compatible and where we have participated in similar actions to an imported item. 10. The "Share Something" Box Should Add Video, Documents, etc.